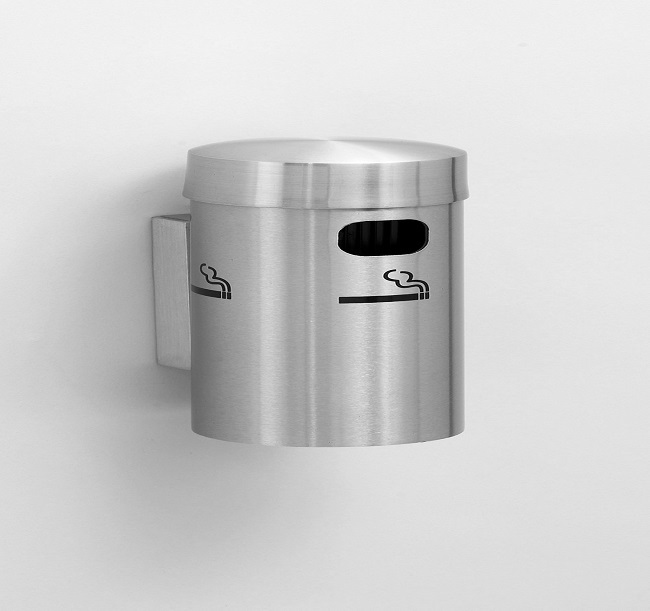 Using Glaro Inc. solid aluminum smoking receptacles is the most effective way to keep areas neat and clean. Glaro Inc. cigarette receptacles provide the most diversified “family” of cigarette disposal products. Please note that in addition to these ash receptacles, there are many combination ash/trash receptacles found on other web pages where the waste receptacle collections are presented. Every facility has the potential to utilize a combination of coordinated floor, wall, and table top cigarette receptacles and waste receptacles. Glaro Inc. presents three distinctive lines of Smoking Receptacles: Deluxe, Value-Max, and Compact. The Deluxe series has maintained a reputation for being the finest quality, indestructible smoking receptacles in the industry, featuring a 3 ½ inch diameter and a 1/8 inch thick wall tubular body. Glaro Inc. Smoker’s Posts are the original “post style” cigarette receptacles. The Deluxe Smoker’s Post series presents a sophisticated stylish design to satisfy the tastes of leading architects and designers. A single disposal hole is located in the front, helps keep water out, conceals odors, and helps extinguish smoking debris by limiting internal oxygen. All models in this series include an interior snuffer panel to help extinguish smoking materials. All units have spring snaps to secure covers. Floor models are available in portable, in-ground mounted, and surface mounted models. The portable floor models have bases weighted with solid steel to insure stability under any conditions. Base bottoms have a special rust preventative coating. In-ground units are supplied with a mounting assembly for core drilling into existing concrete or for setting in fresh concrete. Surface mounted models are supplied with a mounting assembly that can be bolted into existing concrete with the use of expansion bolts. All three models have a convenient push button release at the bottom of the body tube to release it for emptying. Wall mounted models are available in 8 inch, 12 inch, and 24 inch height that have a unique concealed mounting bracket featuring a tamper resistant security design. They are easy to empty by service personnel without the use of a key. An optional stainless steel security cable that permanently connects the cover and the body to the wall mounted back plate is available. The Table Top model provides a wind-proof solution for collecting ashes and smoking debris. These attractive high capacity 3 1/2 inch diameter by 8 inch high receptacles have a large capacity. They are ideal for outdoor patios, cruise ships, decks, outdoor clubs, restaurants, and pool areas. Glaro Inc. Smoker’s Posts are the original “post style” cigarette receptacles. The Value-Max Smoker’s Post 2400 Series offers a sophisticated design similar to the Deluxe 4400 Series at a lower cost. The Value-Max series has a more streamlined look and a slightly different top as well as a more rectangular disposal hole. It features a 3 inch diameter and a 1/16 inch thick wall body tube. The single disposal hole is located in the front, helps keep water out, conceals odors, and helps extinguish smoking debris by limiting internal oxygen. This series includes an interior snuffer panel to help extinguish smoking materials and has spring snaps to secure the cover. Wall mounted models are available in 12 inch and 24 inch heights that have a unique concealed mounting bracket featuring a tamper resistant security design. They are easy to empty by service personnel without the use of a key. An optional stainless steel security cable that permanently connects the cover and the body to the wall mounted back plate is available. The Compact Series of hand spun aluminum Wall Mounted Smoking Receptacles has a smaller model for low traffic areas and tight spaces. This model is supplied in a clear coated satin aluminum finish. The F203 body release from the back-plate for emptying. Designers, architects, purchasing professionals, and building managers, appreciate having a selection of 31 tough burn-proof finishes to choose from. 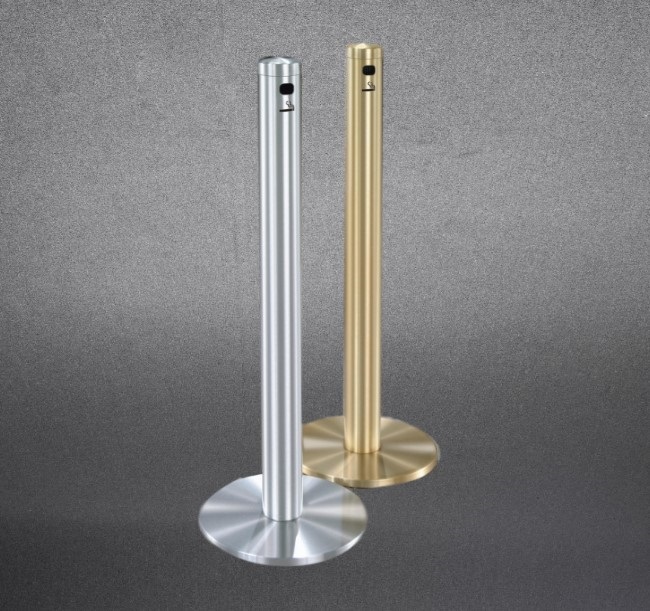 Finishes include satin aluminum, tarnish proof satin brass, and 29 textured and smooth powder coat finishes. All of these finishes are baked onto carefully prepared aluminum to insure a lasting finish bond. Glaro Inc. has specialized in manufacturing cigarette receptacles since 1947 when smoking was a very popular indoor and outdoor activity. Many models in the early years looked like urns and thus the common term “cigarette urns” became popular. 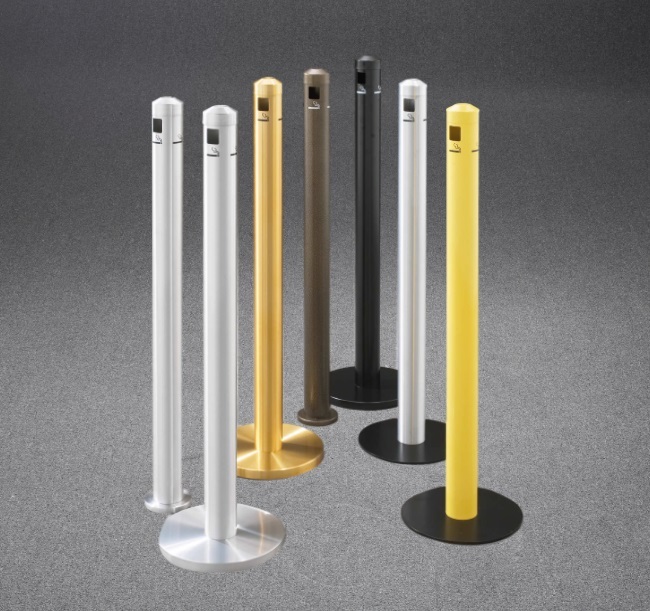 However, individual needs and design preferences for cigarette receptacles have evolved, inspiring our designers to create an innovative concept by introducing the tubular post design. Glaro Inc. continues to bring the time tested and perfected hand polished satin aluminum finish. Intricate shapes are offered by incorporating hand spun aluminum into the manufacturing process. Today, Glaro Inc. cigarette receptacles incorporate recycled metals and packaging materials, that are post-consumer recyclable. Because Glaro has maintained a high standard of quality and customer satisfaction, the company is considered to be a leader in the cigarette receptacle market.